This cherry wine recipe uses a mixture of sweet and sour cherries to produce a delicious rich wine with a heady aroma. If your sweet cherries come before the sour, just freeze them until you’re ready to use them. All you need to do is to put them in an air-tight bag and pop them in the freezer. They’ll be fine for a couple of months. When defrosted they will be softened, which makes it easier to crush them. 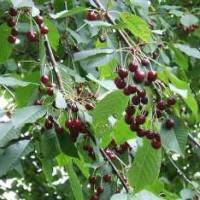 You may find the page How to Grow Cherries on the Allotment Garden web site helpful. Note: Ideally you want a 50/50 mix of sweet and sour cherries. If you don’t have at least 1lb of sour cherries, add the juice and zest of a large lemon to the pulp. Remove the stalks from the cherries and rinse. Pour on 4 pints of boiling water. When cool, add 1 Campden tablet, crushed and dissolved in a little warm water. Boil all of the sugar in 4 pints of water for 2 or 3 minutes and, when cool, mix into the pulp. Add the yeast and yeast nutrient and cover and allow to ferment for a week, stirring daily. Strain and press and return liquor to a clean fermenting bin. Pour through a fine sieve carefully into a gallon jar, leaving as much deposit behind as possible. Rack, as necessary, adding a Campden tablet after the first racking to stop fermentation. Makes 1 gallon of wine. This wine is best left for at least year after bottling to mature. Hi how long after the Camden tablet do you add the yeast? How much yeast and yeast nutrient do I put in? Unless the packet instructions say otherwise, a small teaspoon full will be plenty. You can omit yeast nutrient but I’ve found better results from using it. The fermentation gets going better and lasts longer.